Among the many galleries at art hub 56 Bogart, located just across the street from the Morgan L entrance, Zaltar’s Gallery of Fantastical Art is probably one of the most unique. Artist Stefan Pokorny has used it to curate it a retrospect of his very unusual career: Several classic paintings are evenly spaced throughout the gallery (such as “From Groceries to Still Life” which features a blue plastic bag), but the majority of the mostly permanent installation is comprised of Pokorny’s hand drawn maps, hand sculpted and hand painted figurines and landscapes, and a collection of glass-encased notebooks featuring his first renderings of a D&D world, which he drew during his teen years. If you’re thinking “Whoa, a D&D gallery? I’ve never heard of that!”, you aren't alone. 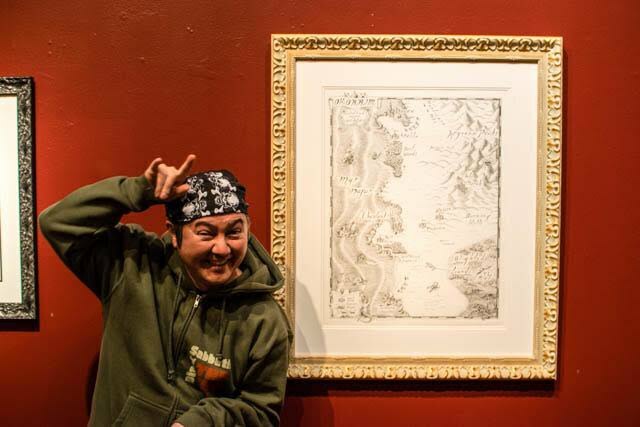 “It’s impossible to find a fantasy art gallery because there are none— there are galleries that do fantasy shows, but that is it,” said Zaltar's gallery manager and event coordinator Wondy Amare. “If Andy Warhol can take soup cans and turn pop art into high art, we should be able to do the same with fantasy art,” he added. Pokorny founded his miniature terrain design company Dwarven Forge twenty years ago in 1996. When Bushwick Daily caught up with Stefan, he had just finished sculpting a flying buttress over at the Dwarven Forge office, a few blocks away from his gallery. Pokorny's intricate, signature world Mythras is a piece which has been constantly tweaked over many years; even in its frame sits unfinished. As an artist wholly devoted to his craft, Pokorny says that Mythras will inevitably change and evolve into something else. Currently, its story is that on Mythras, the human population was reduced to 5% and all remaining survivors live in the capital of Valoria. Does the premise entice any of you gamers? Another world Stefan put on paper at Zaltar’s was first imagined by Luke Gygax, the son of the original creator of D&D. If you play D&D and find it hard visualizing the world your Dungeon Master has created, using physical pieces can help you keep your bearings. Dwarven Forge gaming sets are sold in a variety of different sizes and mashups of pieces, which means that you can even use them for a game other than D&D. 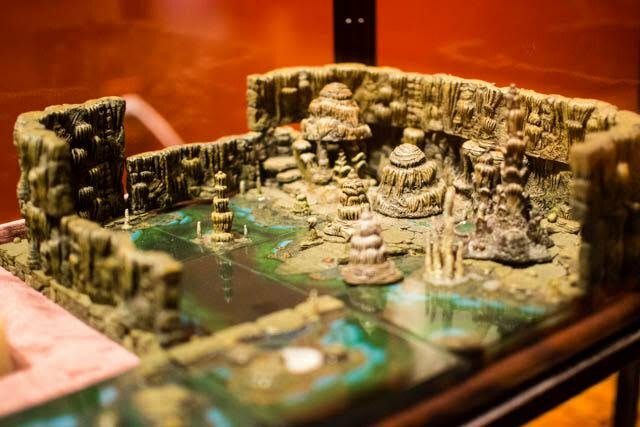 “Since 1996, thousands of loyal collectors have purchased Dwarven Forge sets for their miniature and RPG games, cool dioramas, and for the beauty of the product itself,” says their Facebook page. Though each set is articulated uniquely, customers have the option of eliminating and subbing out pieces for an even more personalized set, with very unusual characters: One of their characters is a sanitation worker, or "sewer warden," who is characterized as being a cross between Rambo and MacGyver. The figurines are scaled at 25-28 mm and are made with a special compound originally developed at Dwarven Forge. Named "dwarvenite", is composed of a nontoxic PVC based material which is as light as it is strong. On a recent afternoon, Amare invited a visitor to stomp all over the pieces to demonstrate the material's durability; as promised, they withstood the pressure. Dwarven Forge is preparing for its fourth Kickstarter, which launches March 6th and will raise funds for the company to develop modular castles. "Board Gaming has now become hotter than video games! I believe [board games] have surpassed video games [in popularity] in projects funded on Kickstarter, and they have had far more success in delivering the goods. Game conventions such as Gen Con attract over 70,000 gamers every year" says Pokorny, noting that diversity in the gaming community is growing, too. 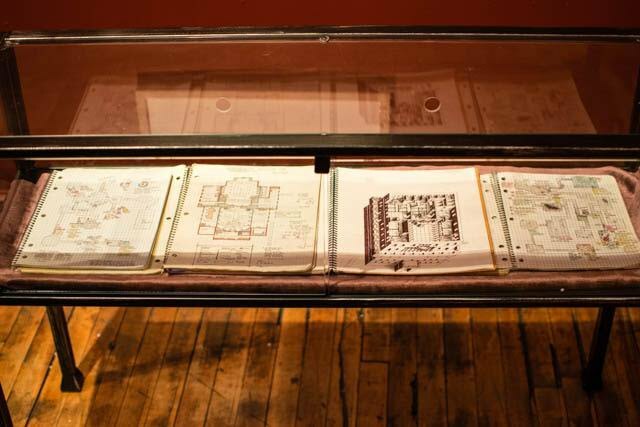 Stefan’s precise artistic vision was influenced by his father, Jan Hird Pokorny, who owns a New York City architecture firm that specializes in preserving historical buildings. Stefan’s eye for detail inspired Josh Bishop to create a documentary about him and Dwarven Forge: Entitled "Dwarvenaut," it was recently selected for this year’s SXSW Film Festival and will play on March 12th. The film was produced by Nate Taylor, a loyal Dwarven Forger who also helped make their Kickstarter videos. When asked what he loves most about D&D, Pokorny's answer is thoughtful. “It’s the super creative aspect of it - there is no other game, from top to bottom, that you get to create with your friends,” Problem solving in the context of fantasy games like D&D or other board games is a great, healthy way to connect with each other. "I think that the dawn of the tech age is turning our younger generations into drones ...sort of like a subtle zombie apocalypse. 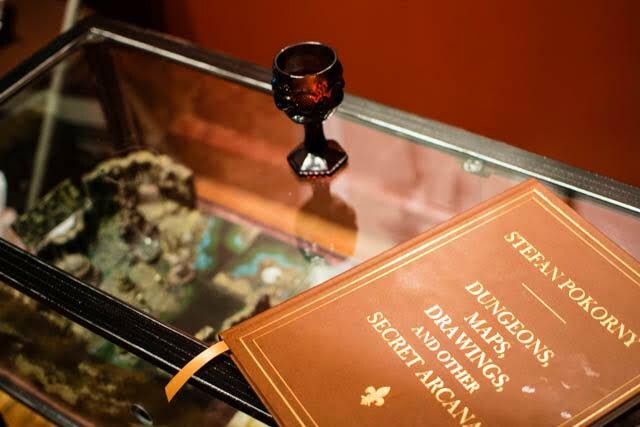 Dungeons and Dragons and other role playing games can save our humanity by bringing humans together to co-operate around the table, socialize, solve riddles, imagine, create, and weave together stories as a group," says Pokorny. Pokorny, Amare, and the rest of the team over at Dwarven Forge are extremely excited to share Zaltar’s Gallery with you. Check out their weekly events on Zaltar's FB page, which include yoga, game night, and painting class. In the future, they hope to hold a movie night with their giant projector, and they’ve already hand picked the first three nights: Excalibur, The Dark Crystal, and Conan. So stop by for a truly different, interesting experience. 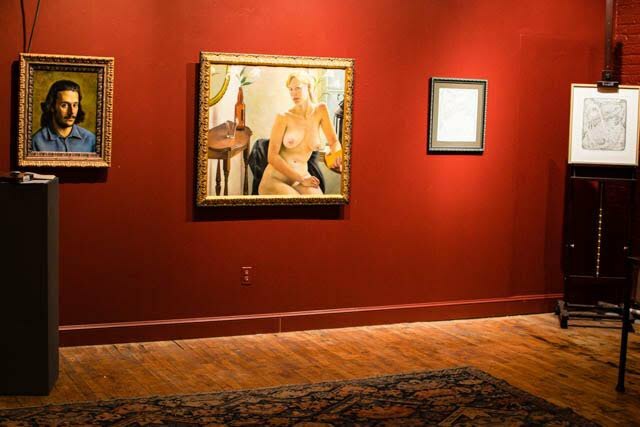 Zaltar's Gallery is open on Thursdays and Sundays from 1-7PM at 56 Bogart Street, right across from the Morgan L entrance. But, do keep in mind of their events happening on those other days.